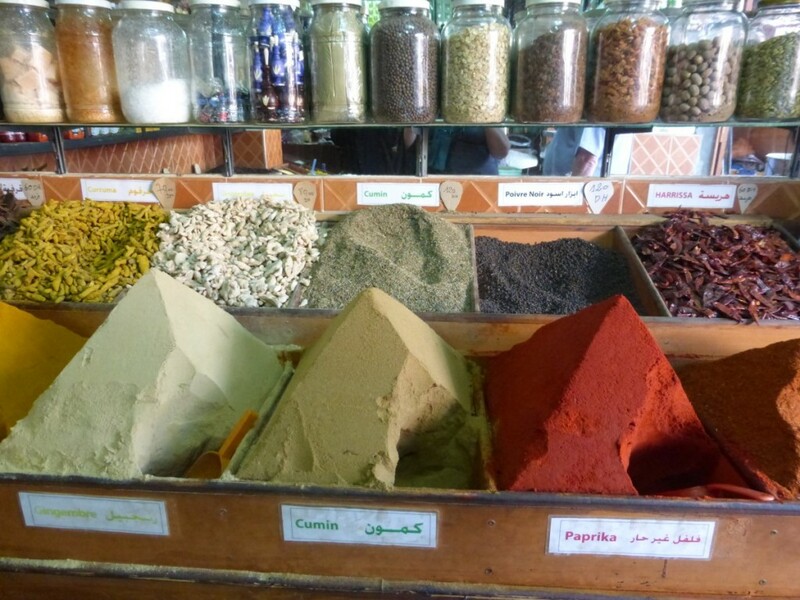 I first visited Marrakech over thirty years ago while working in Morocco back then it had two types of tourist, the very rich and those on the hippy trail, it was not the easiest place to choose as a holiday destination but boy was it fascinating. We have been back three times since, all in the last eight years and have noticed a huge change, many more visitors, most for short breaks thanks to the arrival of low cost airlines, a much wider choice of places to eat and drink but still a fascinating destination that is only three and a half hours from the UK. 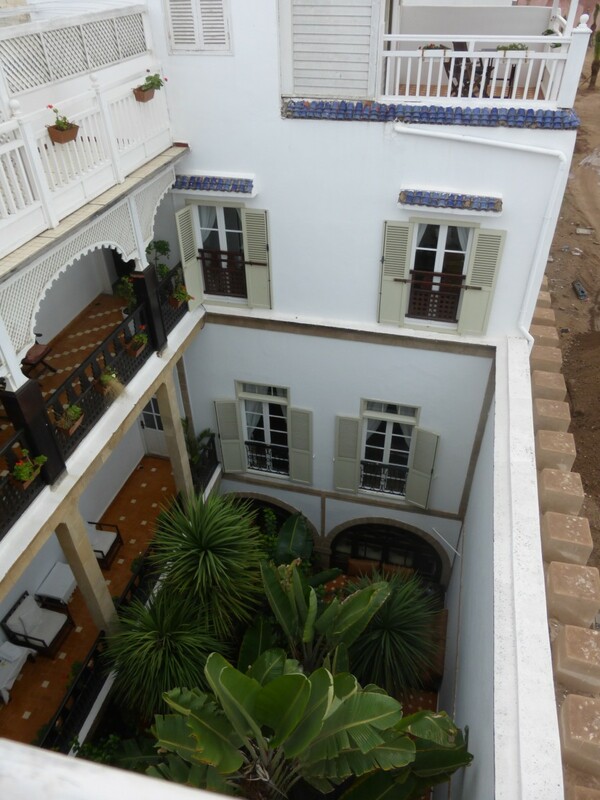 Accommodation options have also changed since my first visit, over the last ten or so years riads, traditional Moroccan houses built around a courtyard, have been converted into small boutique hotels. These are found in the traditional medina areas, north and south of the famous Jemaa El Fna square, the heart of the city. They are a wonderful way to enjoy the hustle and bustle of the city on your doorstep while having a quite oasis of calm for relaxing. A lot of the riads are owned by Europeans and in some instances they leave the management almost entirely to local staff, sometimes this works but sometimes it does not. This means choosing a good riad is very important as many people want to enjoy the spa facilities often on offer or to try Moroccan food cooked and served in the riad. We prefer the southern medina near the Bahia Palace, handy for transfers, the Jemaa El Fna, and many of the main sites. 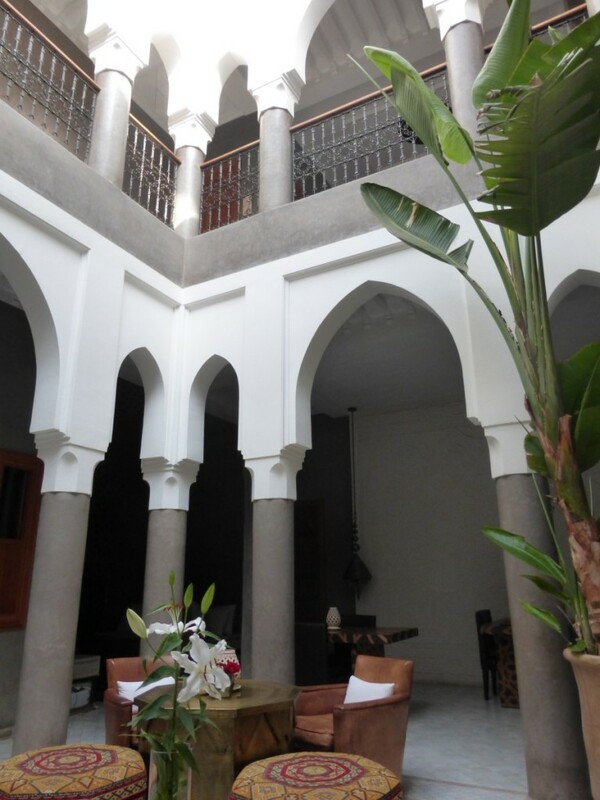 I always research reviews and comments even more thoroughly than for any other travels and this time were delighted with the choice of the Riad Houma. This is a fairly recent addition and is French owned, the care and attention to design is obvious as soon as you enter and the small number of rooms offers a range of options that are good value for money. The staff are all excellent, very helpful and friendly, and starting your day with an excellent breakfast on the terrace is glorious on the frequent sunny days. 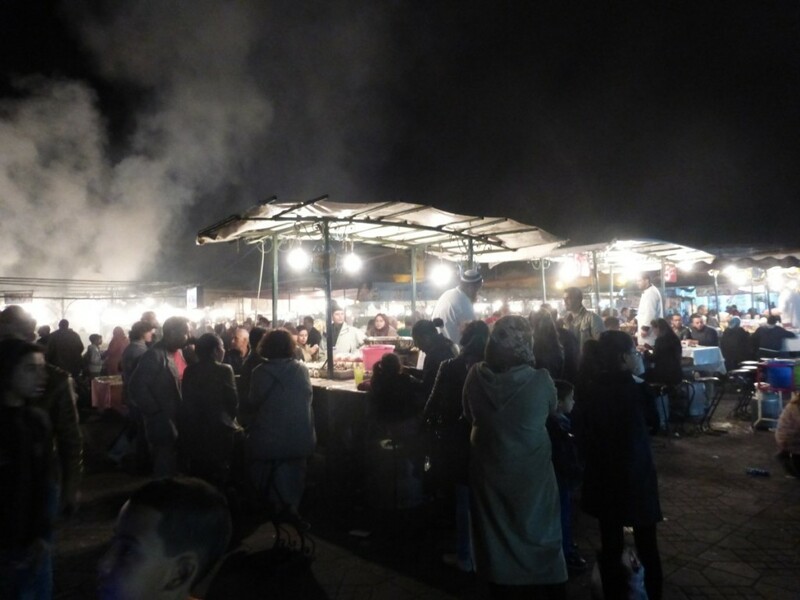 On previous visits we have visited all the major sites and this time the main aim was to try new eating places and to do our Christmas shopping, although shopping in Marrakech is a must on any visit. Among the many new places to eat in Marrakech we tried two that stand out, Nomad in Place Kedina and Le Jardin, 32 Souk El-Jeld both in the northern part of the medina. They are owned by local restaurateur Kamal Laftini who also owns the Café des Espices in Place Kedina. Nomad was my favourite and so enjoyable that it was revisited on the last day. The food is very good, the terrace setting lovely and the service friendly, they also sell alcohol, not that common in the medina. 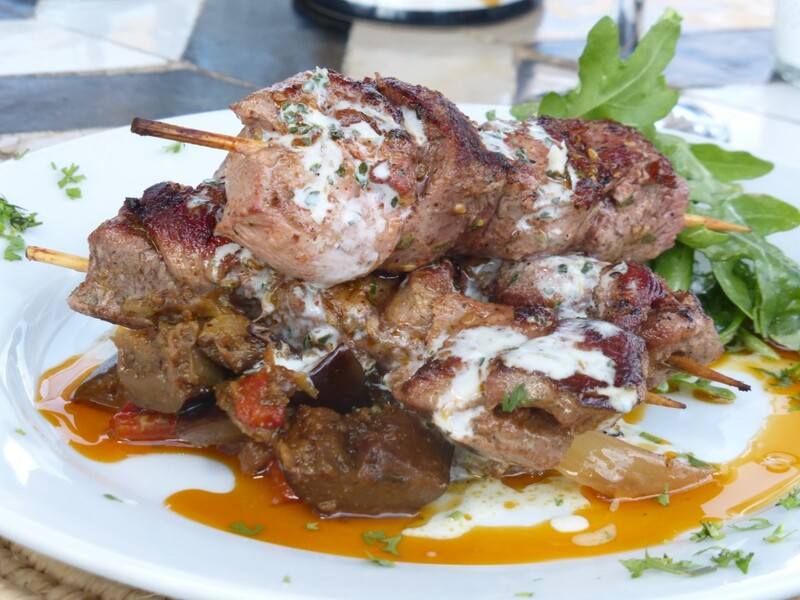 Really good starters of courgette fritters and a beetroot pastry were followed by excellent mains of lamb brochette with aubergine and chicken brochette with cous-cous. Le Jardin is housed in a beautiful courtyard and was a very enjoyable setting for dinner but perhaps slightly lacking atmosphere on the night we went. Our choices were all traditional Moroccan dishes but there were a number of other options available. 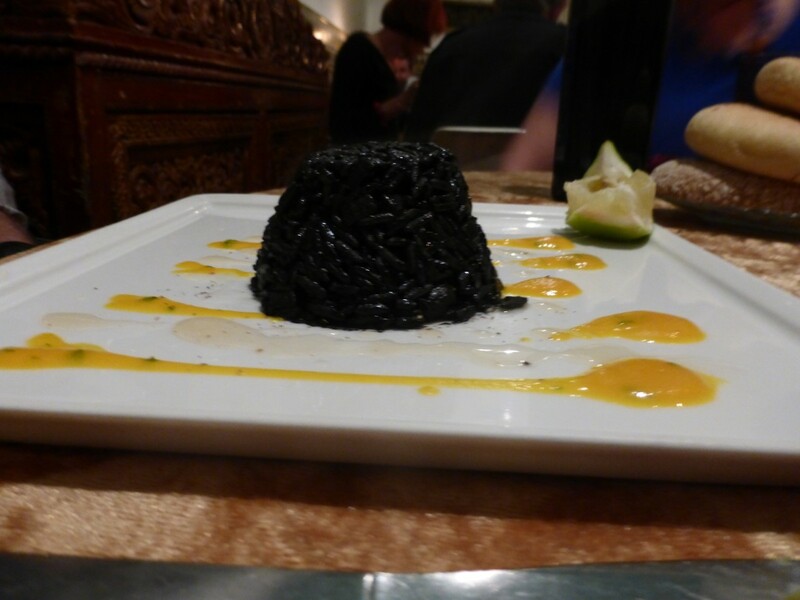 For a birthday celebration we tried Ksar Essaaoussan, this is housed in a sixth century riad and offers a set menu of a pre dinner drink, three courses, wine, and mint tea and Moroccan pastries for just over £20. The food is good but what makes it truly memorable is the atmosphere, service and surroundings, you also get a chance to explore the building before you sit down to a long, relaxed dinner. An old favourite Le Fondouk was revisited and while prices are now on the high side, as ever the food was very good and the service excellent. 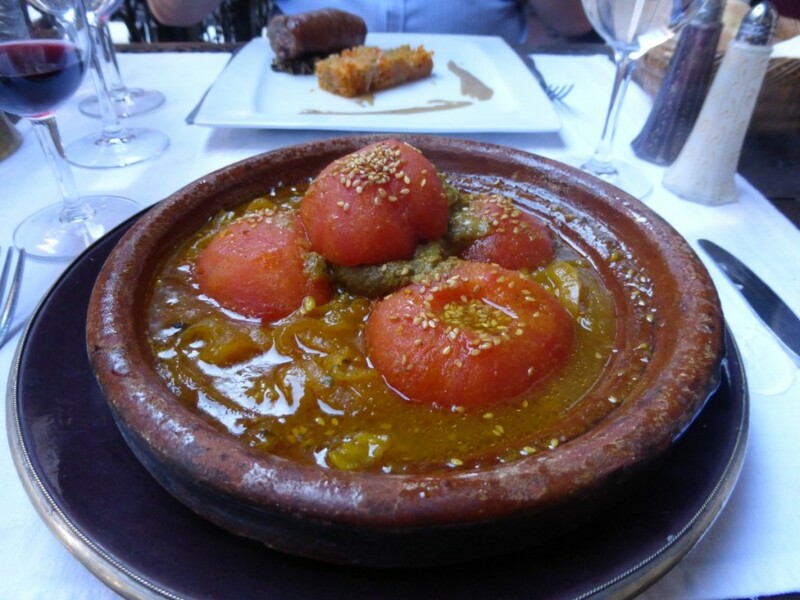 There is always a dish that they produce that just cries out to be photographed and this time the beef and tomato tagine was it, really delicious. There are many other updated recommendations on the city page for Marrakech. A couple of days in Essaouira were also on the agenda for this trip and we booked tickets for the Supratours bus through a company called Marrakech Tickets, www.marrakechtickets.co.uk who purchase them on your behalf and deliver the tickets to your hotel. There is a surcharge of which part goes to a local charity but the service is worth every penny as it saves you having to go to the Supratours office in the new town. 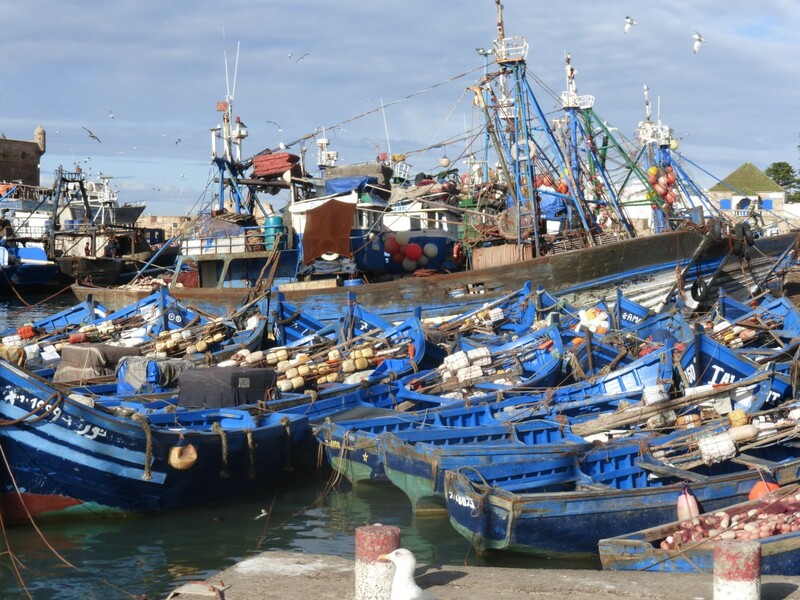 Essaouira is on the Atlantic coast, around three hours from Marrakech It is a lovely town and very relaxed after Marrakech. The town is set to be even more popular with the opening of a direct flight from London with Easyjet in 2015 and since we had last visited seven years ago there had been a large increase in choice of places to eat. There is also a wide choice of riad accommodation and this time we chose the Chems Bleu which was very good, reasonable priced and easy to find, a short walk from the Supratours terminal. 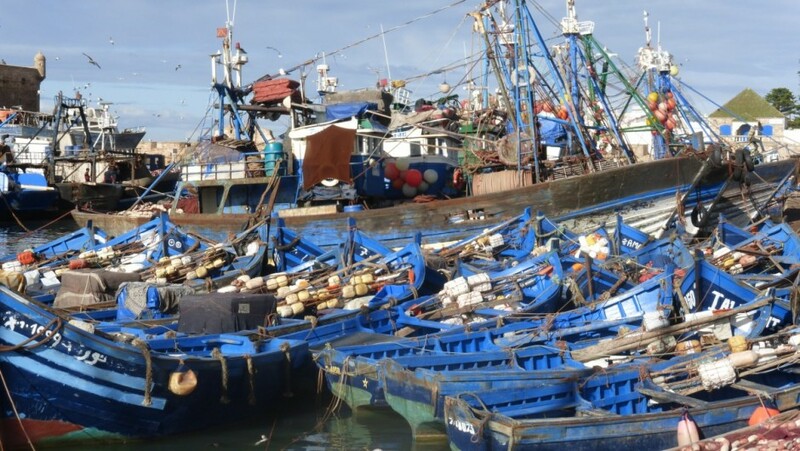 Apart from wandering around Essaouira and taking dozens of photographs of the port and the blue and white buildings one highlight we were looking forward to was returning to Elizir Restaurant for dinner. The owner Abdellatif worked for a number of years in Italy and had not long returned to his home town when we first visited. 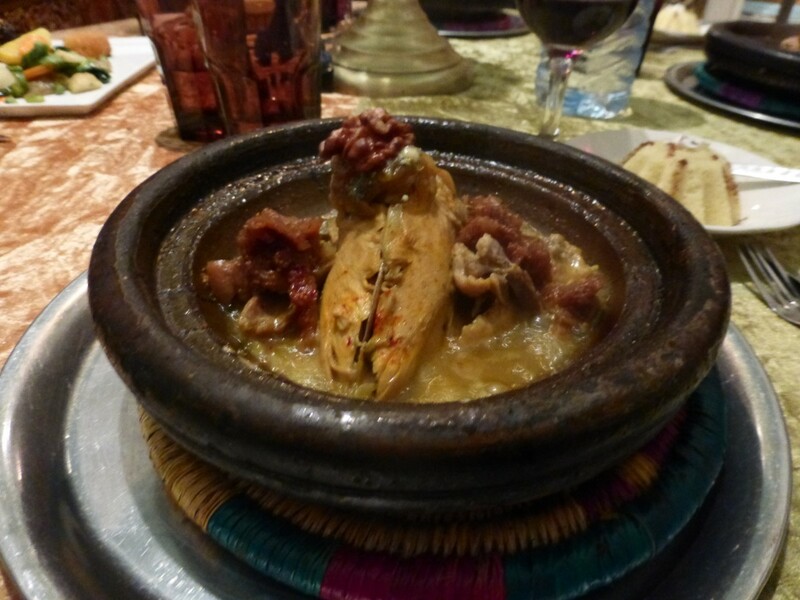 The food, a mix of Moroccan and Italian influences, was memorable and did not disappoint on this visit. The restaurant’s eclectic mix of furniture and collectables and the good music complement the great food. The organic chicken tagine with walnut and gorgonzola and the beef fillet in balsamic were both top notch and went brilliantly with the house red wine. Back in Marrakech the Christmas shopping still had to be completed but having decided what we were looking for, identified the areas for the purchases and practiced our bargaining strategy we were ready to set forth to the souks. We had a very successful day buying original gifts for friends and family at home, made even better by the glorious weather and refreshed by fruit juices Café des Espices and a lovely lunch at Nomad before heading to the airport for the flight home.